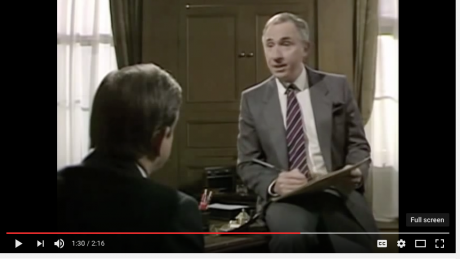 Screen shot of Yes Prime Minister in which Sir Humphrey Appleby demonstrates the use of leading questions to skew an opinion survey.Fidel Castro is dead but a leader determined to unleash a cultural revolution has risen in democratic India. On one dramatic night, an elected Prime Minister announces his decision to purge India of financial corruption and people the nation with honest citizens. Prime Minister Narendra Modi, in one fell swoop, killed 86 per cent of the currency notes in circulation as the legal tender. Thus began the great run on the banks to exchange the old notes with the new ones that remain scarce even after a month. The nation is reeling under the impact of a cash crunch rare in the history of currencies. The demonetisation causes daily chaos in front of banks. More than 80 people either collapsed in the long queues or committed suicide when not able to feed the family. For a nation that subsists largely on cash transactions, the decision has brought untold misery to the common man. For a nation that subsists largely on cash transactions, the decision has brought untold misery to the common man. The Government leaders called it as the Prime Minister’s “surgical strike” against black (unaccounted) money. A judge called it “carpet bombing” because suddenly 86 per cent of the currency in circulation was withdrawn. The political opposition doubted the intentions of the Prime Minister. The Prime Minister dubbed his critics hoarders of black money. Millions of man hours have been lost; thousands of small industrial units have closed and their workers had to flee to their villages. The people’s confidence in the national currency has diminished in the face of ever-changing official notifications. Some basic questions have been raised about the violation of property rights, the legality of the government’s decision, the Prime Minister running a presidential form of Government, the diminution of the role of Parliament and of the Central Bank and the collapse of the informal sector of the economy. An imaginative observer visiting India today would see a nation of currency traders and rumour-mongers. For a month now the national conversation has only been about cash. Modi’s critics focus on the human misery caused by demonetisation. A few economists warn against a decline in the economic growth rate. Psychiatrists see their workload increasing in coming months. The Prime Minister has sought to keep the suffering people’s hope alive by promising a golden future after 50 days. The good people of India must sacrifice for a good cause and suffer “temporary pain, for ultimate gain”. The concept of ‘sacrifice” that has become less appealing in todays’s aspirational India, is being marketed as part of the ruling BJP’s political strategy. Modi is moved to tears in public and still sees signs of his biggest political gamble succeeding. His own app used for a public opinion poll showed that his decision to create a corruption-free India enjoys overwhelming support. This self-conducted poll provoked some to float on the social media the inimitable scene from the British TV comedy “Yes Prime Minister” in which two top bureaucrats discuss how a public opinion poll can be manipulated to bring the desired results. His own app used for a public opinion poll showed that his decision to create a corruption-free India enjoys overwhelming support. Media reports also suggest that Modi’s surgical strike against black money enjoys popular support though no one is sure how long this will last. The rich and the poor, the honest and the dishonest – tell TV reporters that Modi has done a good thing. No one says that dishonesty is the best policy. “For a good cause, I am prepared to stand in the queue for the new notes for a few hours.” This is a set response. A reporter found that one person lauding Modi’s anti-corruption campaign went on to chat about his collecting rent from his tenants in cash and evading taxes! His auto-rickshaw driver told him that Modi had done a very good thing. When the driver abruptly turned into a side lane, the reporter was puzzled. The driver explained that it was to evade a traffic policeman since he had no driving license. The poor, unable to meet their daily needs are helpless but still patient. The Government has launched a massive campaign to wean them away from cash transactions and to switch to digital payments through mobiles and plastic cards! The digital nirvana will elude a vast majority for some years. Those with unaccounted money are stricken with fear and anxiety as the official agencies are busy raiding their hidden treasures. A big cop-and-robbers chase is on as millions of Indians have devised innovative methods to frustrate the government’s effort to extinguish the unaccounted currency notes. A large amount of untaxed money has been inducted into the banking channels through ghost accounts. Ignoring the daily disruption of Parliament over the disastrous implementation of the demonetisation scheme, the Prime Minister attacks the opposition for his public. Deploying rhetoric, he appears as a valiant pro-poor fighter facing an onslaught by the “powerful forces out to destroy him”! The entire political establishment is in a temper as two crucial state-level elections are to be held soon. The Prime Minister has emerged as a powerful leader and some magazines will portray him as Emperor Modi. Demonetisation was his decision, dutifully rubber-stamped by his Cabinet. Modi loves to be in the spotlight. It is all about Narendra Modi and Mr. Modi wants to have it that way. Policies must be personified. The recent elections in some parts of the world have shown that a political leader who lacks theatrical experience and the ability to sell snake oil or used cars cannot go very far. In this era of post-truth politics, telling lies and making politically incorrect and provocative statements makes a politician popular. Donald Trump ought to thank Modi for showing the way to electoral success. More and more leaders are convinced that perpetual confrontation pays in politics. The media has extensively covered the cash crunch causing human misery and economic setback but the social and cultural dimensions of this ongoing revolution call for further scrutiny. Modi is seeking to reverse some recent trends in the history of this young nation. Economic liberalisation made people greedier, fuelled the demand for luxury goods and popularised vulgar displays of wealth. The stigma of corruption traditionally associated with money is ignored as the rich persons have become role models for the younger generation of the aspirational India. Modi’s rise in politics has increased political and social disharmony. Political, religious, social and cultural divisions have been exacerbated in recent times. As a star campaigner for his party BJP, Modi tells a public rally that because of demonetisation, “the poor sleep in peace while the rich wander around at night looking for the sleeping pills.” This after weeks of TV reports from urban and rural centres that demonetisation has hit the poor badly. But the people at the rally waving the party flags to cheer the leader. The Prime Minister then calls upon the poor not to return the money that the rich deposited into their accounts for redeeming the old currency notes. Those with unaccounted cash co-opted the poor with bank accounts with no money. The poor obliged because they were promised in return a small part of the deposited funds! Latent class antipathy is being fuelled. The poor are being encouraged to vent their anger against the “filthy” rich who have been made the new “Other” in a political confrontation. Anyone leading a nation of the poor has to deflect the criticism that his policies are designed to help the rich. He has to appear pro-poor even if his poll campaign was financed by the rich and his policies in the Government have helped the rich. Anyone leading a nation of the poor has to deflect the criticism that his policies are designed to help the rich. Right now it appears to be an electoral necessity to turn the dishonest rich into a hate object. Every political campaign needs “the other” against whom the voters can be mobilised. Many people vote for a leader who they think would “fix” a particular community or “fix” the national economy or “fix” the corrupt people. Modi has gone further than any communist leader in telling the poor to revolt against the filthy rich. The Marxists in India have been called sterile who just profess revolutionary fervour and in the new aspirational India even they have stopped abusing the rich. In India it is child’s play to start a clash between two religious communities but it is not that easy to organise violent riots against the rich. The vigilante groups associated with the BJP’s extended political family know it well. A rhetorical attack on the filthy rich in public speeches is safe. But to stone a corrupt rich person caught with a huge pile of unaccounted cash is not like attacking a beef-eater or a girl dancing in a skimpy dress. No one has tried to organise a protest in front of the house of a tax-evader featured daily in the well-publicised police raids. The mansions are unlikely to be stormed also because the poor in India generally prefer to co-exist with the rich. They tend to blame their fate rather than the exploitative rich for their plight. A Gandhian Congress leader once told this writer how difficult it was for his party to free the poor villagers from the clutches of the money-lenders. The oppressed would reject their help and side with the oppressor. If the poor bank account-holders heed Prime Minister Modi’s advice and revolt against those who trusted them with their money, a social conflict will break out on a scale that no authority will be able to control. Modi’s tirade against the dishonest rich, meant to prove his pro-poor credentials, is not what was expected from him by the wealthiest business leaders who helped Modi win the elections. Nor did they expect that he would unleash the “inspector Raj”, reverse economic liberalisation and dampen the demand for their goods. The rich business leaders may be saying “You too Brutus”. None of them has dared to say that publicly. If anything, some corporate leaders have gone on record praising Modi’s decision. Will the current campaign make the people more honest? Will this campaign to change the people succeed? An unintended consequence is quite significant. Corruption has sucked into its net a much larger section of society, including the rich and the co-opted poor. The rich recruited the poor to stand in long queues to exchange old notes them. They recruited many bank managers. The ghost bank accounts proliferated. The scrutiny of millions of new tax cases opens up a sea of opportunities for the corrupt officials. The bureaucrats enjoying more discretionary powers will be more tempted to demand bribes. Already the new notes with a higher denomination of Rs 2000 have been used for bribing Government officials and for stocking in the hidden vaults of the illegal money exchangers in the past few days. A cartoon shows Modi wondering whether he should now demonetise the new Rs. 2000 note. If the anti-corruption campaign is to be seen as an attempt to reform the political culture, two key elements are missing. Political parties are not accountable for the donations they get for fighting elections. A TV anchor remarked that if it is a war against corruption, the next election campaign will see no helicopters flying with leaders. They will be forced to share taxi rides with their opponents and will have to address joint rallies in order to save money. There is no move to introduce a system of state funding of election campaigns and banning all direct private donations, a major cause of corruption. Corruption has sucked into its net a much larger section of society, including the rich and the co-opted poor. Prime Minister Modi’s earlier bid to unleash another cultural revolution met with a very limited success. He launched a cleanliness campaign with fanfare but the people have not refrained from littering public places or defecating and urinating in the open. The municipalities have not deployed men and machines needed to demolish the mountains of rubbish. Some undesirable kind of cultural revolutions were unleashed by the followers of Prime Minister Modi. They tried moral policing and chased away loving couples from public places. They tried reconverting those who had abandoned Hinduism for another faith. They raided beer bars. They prescribed what not to eat. They told girls what not to wear. They told the universities what not to teach. They told writers what not to write. They told reporters what not to report and newspapers what not to publish. They told cine-goers what films not to see. Chroniclers of revolutions must come to India to observe the ongoing as-yet peaceful revolution with political, economic, social and cultural dimensions. Those hoping for the success of this major experiment in social engineering may be disappointed. The official campaign against the corrupt is not going to suppress greed or reform the corrupt. The governments in the past tried but failed to curb black-marketing, hoarding and money-laundering. Society’s attitude towards money is unlikely to change. The economic consequences will be recorded when definitive data is available about the damage to the informal sector, fall in the GDP, setback to major industries and the decline in consumer confidence. The economic argument cannot be clinched because economists are divided and even the Nobel Laureates who paint a grim picture are derided by the Modi camp. The political fall-out will be known when the results of the coming elections in two important states are announced. A more definitive outcome may be recorded more than two years from now when Modi will once again seek to win the parliamentary elections. Prime Minister Modi has a secure political future for more than two years. He is not going to be upset even if the demonetisation fails. He has already identified the “powerful forces” that he is fighting, risking his office and life. With his superb ability to communicate with the masses, he will come up with another new narrative. Narendra Modi likes to think big and administer shocks to his political opponents. The disruptive war against unaccounted for cash is just the first step. As pointed out by the experts, the racketeers keep only a very small percentage of their untaxed wealth in cash and most of it is kept in land and property and gold and diamonds and in banks abroad. One expects the anti-corruption campaign to expand its scope in the coming weeks. However, it is likely that historians will be recording yet another arrested revolution.